If there’s one festival that’s put Thailand in the bucket list of any adventurous traveller, it has to be Songkran. Officially occurring every 13 April to 15 April, the whole Kingdom shuts down to engage in a nation-wide ‘water fight’. But it wasn’t always like this. Songkran has a fascinating history, significant cultural importance, and its traditional roots should not be forgotten. Often mis-attributed to being the start of a “Buddhist New Year”, Songkran in fact traces its roots to something a lot more secular: A royally decreed new year of the ancient Khmer Empire. Songkran on 13 April was officially new year of Thailand… until recently! It was only after the Thai Cultural Revolution in 1941 that Thailand joined the rest of the world to make the 1st of January the official start of the new year. Like most Asian civilisations, the Khmer Empire originally followed the lunar calendar, celebrating its new year in November or December. But in Southeast Asia, this is also the period of the wet monsoon, which is the best time for the Khmer people to harvest their crops from the rice fields. It didn’t make sense to celebrate during a period when the hardest work had to be done. Thus, in the 12th Century, the great Khmer King Jayavarman VII changed the New Year celebrations to April. It’s the month when the rice harvest is complete, the seeding of the new crop has not yet begun, and the monsoon rains end. This, the King decided, would give the people more time to focus on great harvests during the monsoon months, the freedom to revel and rest after all the hard work is done. It is also the perfect opportunity to reconnect with family after having spent months away in the fields. 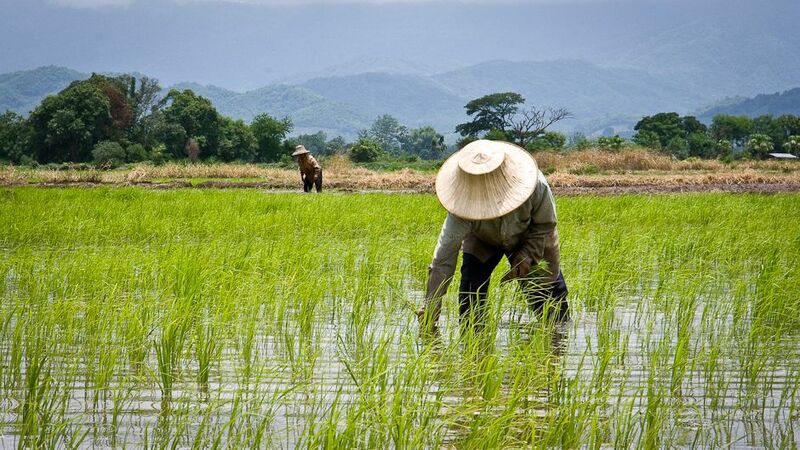 Thailand has a rich agricultural background, and water is essential to its survival. Although the Khmer Empire eventually collapsed in the 14th century, the new year traditions live on in Thailand, Myanmar, Cambodia and Laos, the territories that once formed the great Khmer Empire. It is still celebrated today on the same date, April 13. In Thailand, this festival is called Songkran, which is derived from ancient Sanskrit which means ‘astrological passage’. The Ayutthaya Kingdom (1350 – 1767), which emerged from the ashes of the Khmer Empire, and the ancestor of modern day Thailand, introduced elements of Buddhism and Hinduism to this festival. This included blessings and prayers for the Buddhist Monks, and many pilgrimages to the local monasteries. There, Buddhist devotees would pour blessings of scented water over the monks during a holy cleansing process. The locals would then collect the water and bring it back to their homes and families, believing the water to be blessed and sacred. For many that were not able to make the journey to the temples for such blessings, these rituals were also re-created at home. Instead, they purified their private shrines, pouring perfumed water on them. In some tambons (villages), village elders and priests were as revered as the monks were, and were also blessed with scented lustral water. This tradition stretched to the households, where the young would similarly pour scented water over their parents or grandparents, and receive blessings in return. April is when the weather is hottest and driest in Thailand, making every drop of water truly precious. 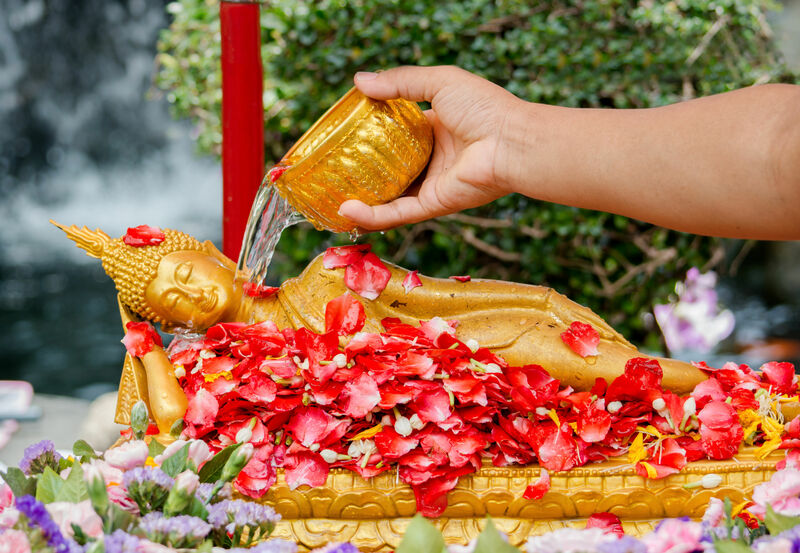 Thus, it is believed to be a tremendous sign of respect to offer water to the Buddha, monks and other respected individuals during the Songkran celebrations in April. It’s believed that staying wet during this period of astral change will bring forth good rains and fortune for the year ahead. Water also plays an important role in largely agricultural societies like Thailand. Water brings life to the fields, purifies the Earth, and is characteristic of the life-giving monsoon rains. The rural Thai believe that by staying wet during this period of astral change, it will bring forth good rains and fortune for the year ahead. Finally, water is also seen as a purifying element, cleansing the Earth everywhere it flows. In Thai custom, pouring water over the monks, elders and statues of Buddha symbolises a ritual cleansing of the old. It is seen as a purification of sorts, freeing oneself to receive the blessings and good karmic forces of the new year that’s arriving. Now imagine you’re a kid in Thailand, and you’re told—no encouraged—to douse grand papa and mama in water. Nevermind why. You’d just do it. That is probably how every Thai child felt whenever Songkran came around. While the significance and symbolism of the water is never forgotten, the act of pouring water alone is bound to incite playfulness and a little mischief. Thai children revel in the opportunity to ‘play’ with water during this celebration. For many families, the laughter and innocent joy of children playing with water, especially in this time of merriment and family bonding, can hardly be frowned upon. In fact, it can get irresistibly fun even for the adults too. As the years go by, and the children grow up, the same playfulness extends to their friends, colleagues and their own families a generation later. Today, many of these water pouring customs have evolved into city-wide water ‘fights’ today. In 2011, the festival even entered the record books, being the largest water fight in the world. To many outsiders, Songkran appears simply as a ‘water festival’. But for many Thais, the traditional beliefs still hold true today, even if it comes from the nozzle of a Super Soaker. It is thus very important to remember and understand the origins of this tradition, and what it means to the Thai people. It is perhaps also characteristic of Thai culture that they are generally so welcoming and open to such modernising of their ancient customs. It shows in their creative products, and it shows in the way they celebrate. Even foreigners are openly welcome to partake in these celebrations, traditional or otherwise. 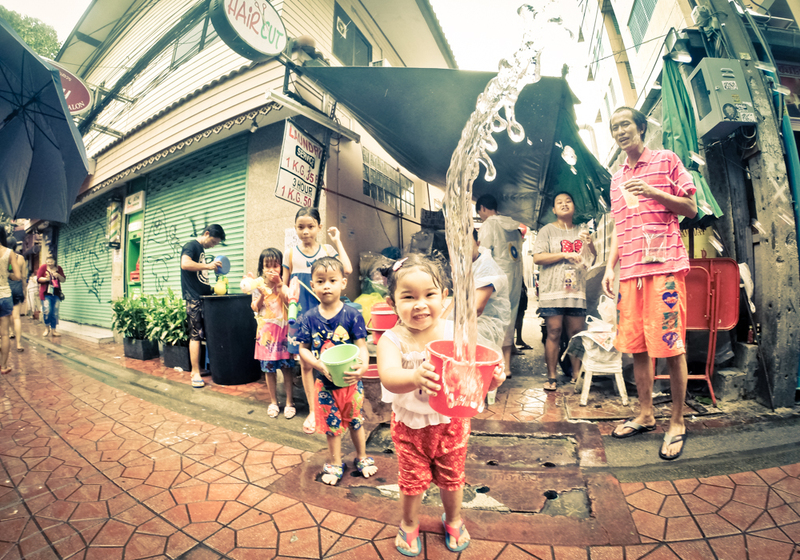 Today, Songkran is an eclectic mix of tradition and playful fun, and you can experience it all in Bangkok alone.